The major traffic delays in Truckee, California on August 23 was caused by I-80 sinkhole. But this is not so very big, only about 3-feet wide and need immediately fill-in because 2-lanes on the road had to be closed for safety precautions. 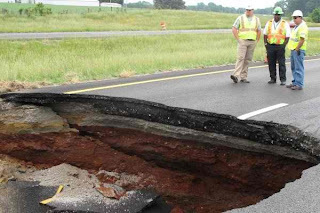 According to Inquisitr, "the I-80 sinkhole is only about 3-feet wide but it has still caused a major headache for travelers. Two lanes were closed on the highway forcing major delays in the area." Authorities still undetermined the caused of the sinkhole, but there's a report that the road was opened up on Friday morning during a paving operation near Donner Pass Road. The California Highway Patrol are expecting the highway to be completely reopened by 6 pm tonight but it seems that they could have a problem when it's become available to all motorists. Comments or suggestions about "Major Traffic in Truckee, California caused by I-80 sinkhole" is important to us, you may share it by using the comment box below.